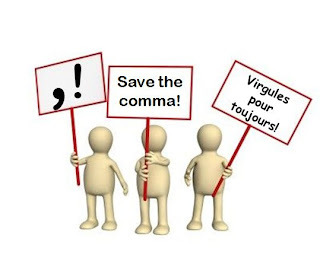 It is time to save the comma. It seems to have gone out of style. And the cost is clarity. I first noticed this at a client organization where numbers in many of the documents were comma free. They had 4621 people enrolled in a particular program. Shouldn’t that be 4,621? I blame Microsoft Excel and its delightful capability of lining up the commas and periods in the numbers automagically. Unfortunately, these people didn’t notice auto-comma isn’t a feature of Word or PowerPoint. More worrisome than the missing commas in numbers are those absent from sentences. It can be really confusing. Consider these two sentences. The student said the teacher is crazy. The student, said the teacher, is crazy. Identical words. Yet the addition of two commas completely changes the meaning. Just who is crazy? That example comes from Lynne Truss, author of Eats, Shoots & Leaves: The Zero Tolerance Approach to Punctuation and Eats, Shoots & Leaves for Children: Why Commas Really DO Made A Difference, two books dedicated to correct punctuation. While far from a punctuation purist, I do like the way commas help make a sentence easier to understand. I’ve had the good fortune, recently, to lead a class of college students. In grading their papers, I have to pencil in commas so I can understand their meaning. Even the very good writers, which several of them are, seem to be punctuation challenged. Some really helpful guidelines about comma use can be found at Purdue University’s Online Writing Library (OWL). There’s even a section on advanced comma use. “But the rules of grammar are changing with the times,” you say. “We’re on line now. We’re not so fussy. We don’t have time.” I might argue that taking the time to be clear will save you time in the long run. And maybe money. A misplaced comma wound up at the centre of a $2-million lawsuit between cable, Internet and phone provider Rogers Communications and one of its suppliers. Rogers thought it had a five year contract at a fixed rate, but a pesky comma, right before the word “unless,” rendered that term invalid. “Cough up the cash,” said the supplier and the regulator. So save the comma. You never know when it will save you. That would be Rule #5.